This “Step by Step Guide to OKRs” is a practical guide to goal setting that offers concrete examples to help you start setting impactful and meaningful goals. This book teaches you how to manage a team better and create a feeling of success. If you find the guide helpful, don’t forget to share it. Objectives and Key Results (OKR) is a critical thinking framework and ongoing discipline that seeks to ensure employees work together, focusing their efforts to make measurable contributions. This is how I’ve defined OKRs and you’ll find an analysis of this definition in the 2016 book on OKRs that I co-wrote with Paul Niven. Paul’s really the author here and I’m really the OKRs coach. So how did a guy like me become an author? Simple answer: I set OKRs. My Key Result was “OKRs book published by a leading publisher such as Random House or Wiley”. It was a major stretch for someone who’s never written a book before. It felt nearly impossible, and I almost gave up after a few months. Then, I decided to publish a white paper as a first step. The next thing I knew, Paul read the white paper and suggested we co-write a book. The rest was history. I’m amazed at the immediate impact OKRs can make in almost any organization. And I see the positive impact all the time, even with larger organizations such as Zalando, eBay, CareerBuilder, Zalando, and Dun & Bradstreet, and Booking.com. Whether you, your team, or your company deploys OKRs, I expect that you will experience a tremendous increase in focus, engagement, and alignment. When I say OKRs is a critical thinking framework, I mean it’s all about asking questions. Questions like “is this really the right objective?”, “does this key result really reflect achievement of our objective?”, and “what is the intended outcome of that task?” I’ve found it can be easier to just go to work and do your job without asking these questions. However, my mentor, Jeff Walker, asked me “when you go on a hike, do you have a destination?” It’s amazing what you can accomplish at work when you pause to define and align on your destination. The OKRs model is a simple way of defining and aligning on your destination at work. 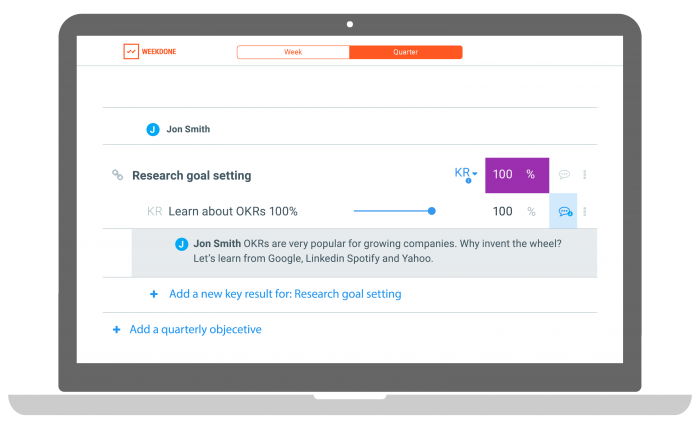 And, more and more of us are embracing the OKRs model. Just two years ago, I complained that there were no books covering the topic of OKRs. 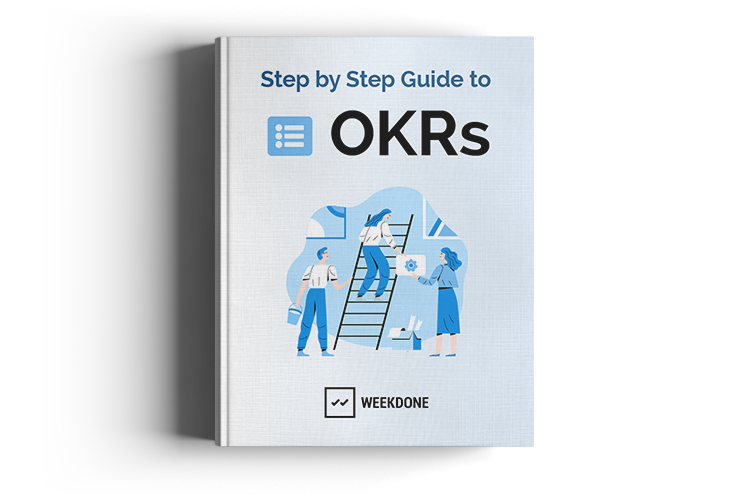 Today, we have Christina Wodtke’s Radical Focus, Niven & Lamorte’s Objectives and Key Results, and this eBook on OKRs created by the team at Weekdone. While I expect this eBook will answer many of your basic questions about OKRs, I truly hope it inspires you to define and align on your destination at work. And get there! Getting the right tasks done. Profit. This is probably the most simplified business model that fits any company. And it seems easy. Well, it isn’t. Figuring out exactly what you have to accomplish is hard for any business. You may have a great idea, an inspiring vision, and an impeccable gut feeling, but that’s not enough. This book is about that: about getting the right tasks done. It’s about setting and communicating the right goals and understanding how to achieve them. It teaches you how to manage a team better and more efficiently. It shows you how to get the maximum out of your team, thus giving a feeling of success. It’s about Objectives and Key Results, better known for their acronym: OKR. Things to know about setting goals. Objectives and Key Results (OKR) are an increasingly popular methodology for increasing you and your team's productivity and focus. 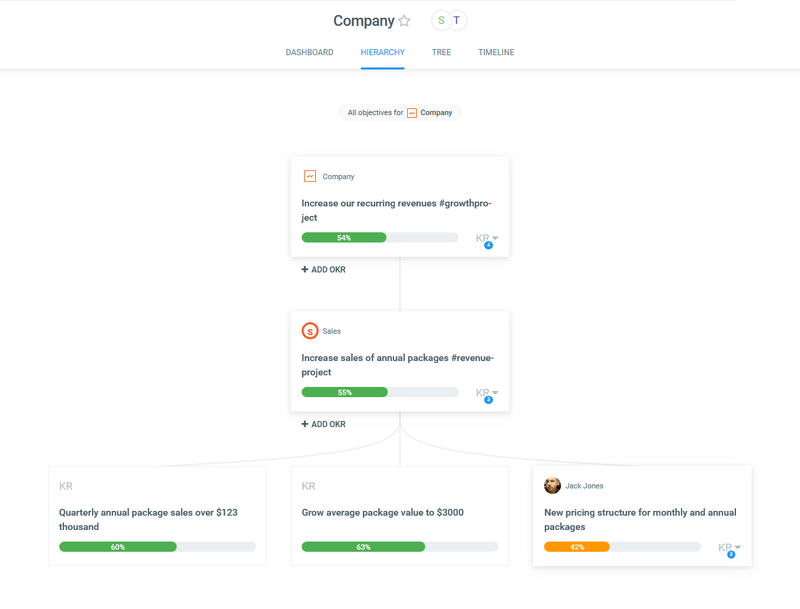 In simple terms, OKR is an easy process of setting company, team, and personal goals then connecting each goal with 3-4 measurable results. As you achieve those results, the whole objective gets marked done. In recent years, OKR popularity has increased greatly. We've seen companies big and small, from churches to Fortune 500, implementing it with success. 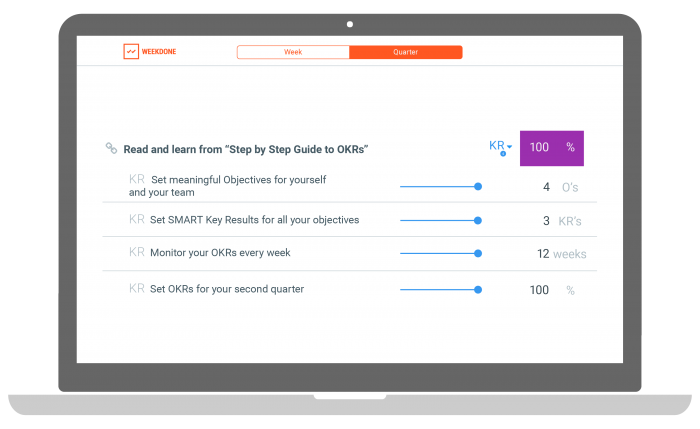 As the world becomes increasingly more integrated, OKRs are a simple way to create structure for companies, teams, and individuals. The most surprising aspect of OKRs is that it suits everyone, regardless of their industry or size. Each team can find an optimal way for implementation. Keeping this in mind, it's always fascinating to learn how successful corporations are using OKRs. Sam, a 30-something year old ex-Silicon Valley founder, was recently hired as a marketing manager for a small company with 100 people working from 3 different offices across the US. He was brought in as things were not looking good. Revenue had been declining for a few years, the marketing team’s morale was low, and the executives felt a breath of fresh air might do the trick. The marketing team was disengaged. Despite their best efforts they hadn’t been able to achieve positive results. What’s more, their salary was tied to revenue which meant their income was declining as well. There were talks of layoffs and everyone was worried about the end-of-year review. Luckily, Sam became a much-needed breath of fresh air for the company. His ideas would change both the team and the company. Of course, nobody said the process was going to be easy. All good things require work and commitment. But in this case it was well worth the struggle. In every team, department, and company, all workers have a specific role to play. Like gears, these employees work together to keep the machine (the company) running. But humans are not machines, they won't work mindlessly. They need to know what they are doing and why they are doing it. Not to mention, how it affects everyone else and the company. If you're in a leadership position, you probably have a good understanding about why things are as they are in your company. It's easy to forget that employees, doing their day to day jobs, dealing with all the small mundane tasks, don't have access to this big picture. The benefits of OKR methodology is just that: to make sure everyone knows what they are expected to do and why. OKRs, on a personal, team. and company level make up a system that shows how everything one person does connects to the work of others. If an employee knows that not meeting his goals makes achievements harder for people in other departments, they will want to try harder. When everyone knows how their work matters, it increases overall engagement, motivation, and determination. It's a psychological effect: no one wants to be the weakest link, so they’ll try harder. This is a very powerful tool. How the ball got rolling: History of OKRs. 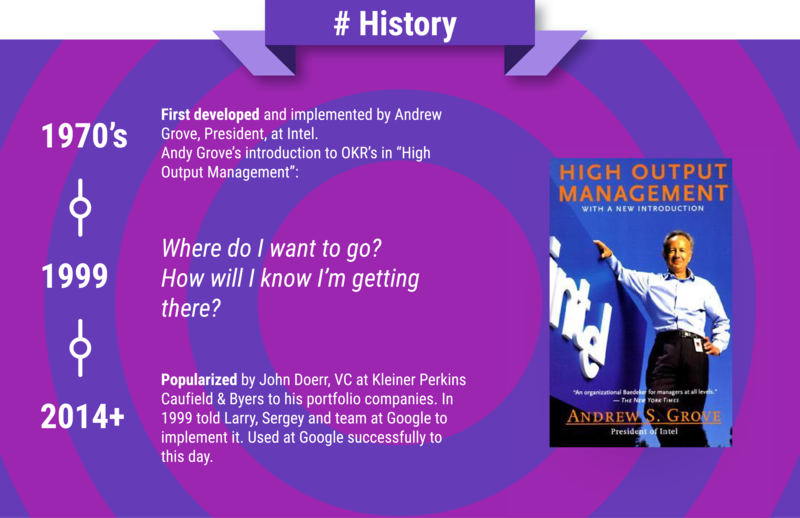 OKR methodology started its climb to popularity when John Doerr introduced OKRs at Google in 1999, but OKR methodology had been championed even earlier by Andy Grove, the late CEO of Intel during the 1970s. With his startup background Sam was used to getting results. In the Valley he had developed a mentality of getting things done by being agile and flexible. The key to that, he knew, was setting meaningful and impactful goals to be executed right away. After extensively researching goal setting techniques (using Google search), he ended up with OKR methodology. The question now was, how to implement them on a demoralized team, who still saw him as an outsider? From Andy Groove to Larry Page and Beyond. How will I pace myself to get there? He also suggested objectives should be set more frequently, on a quarterly or monthly basis, as the fast-paced world requires constant feedback. He also believed multiple performance management tools should be used in conjunction with OKRs. Finally, he believed OKRs should be stretch goals and achieving them 100 percent should be next to impossible. Having gotten a lot of leadership lessons from Grove, John Doerr introduced the system to Larry Page and Sergey Brin, co-founders of Google. Nowadays, OKRs have been implemented at many companies from LinkedIN and Spotify to smaller SMEs. The only way to meet you quarterly objectives is to work hard on them every day. Leaders want to constantly know what’s going on in their teams without being inundated with useless information. Each week, employees answer these questions and a manager can get an overview of what's going on. Customers had been using Weekdone for their weekly planning for about a year when many of them started asking: could we start using Weekdone to manage long-term objectives as well? 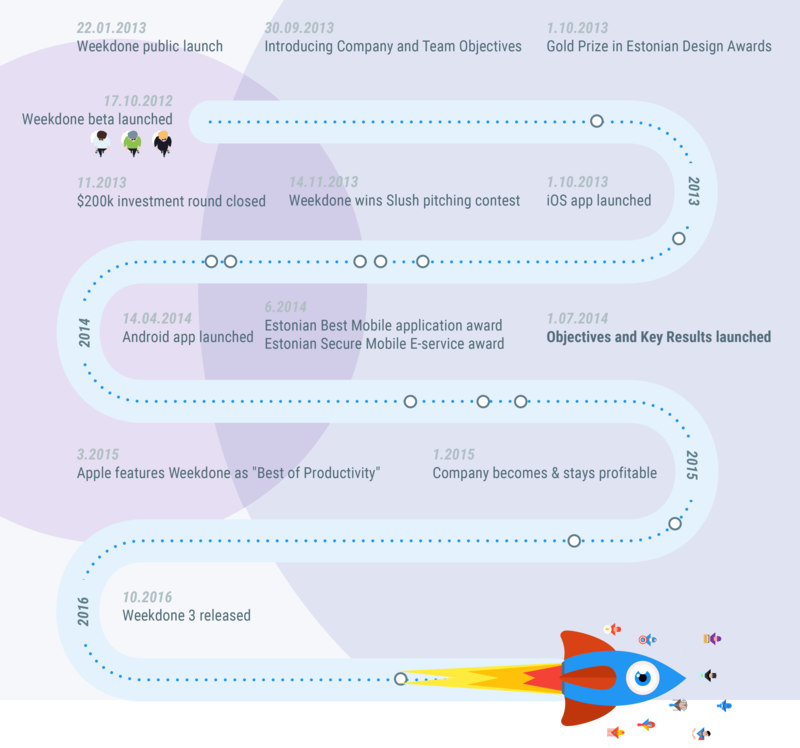 It was a great idea and Weekdone incorporated OKR into the app. We can see that combining these two methodologies yielded marvelous results. The interest in OKRs has been rising rapidly over the last year and every week more companies from small three person teams to Fortune 500 companies want to try it. And for a good reason. Most companies have some sort of goals, or at least an idea about how to make money. In the OKR framework objectives are much more than that. It takes a lot of thought to set good quarterly objectives. On the one hand, they must be broad, visionary strokes, but they must also be relevant and focused. Objectives should be qualitative and describe the desired outcome. For example: Understand customer needs. 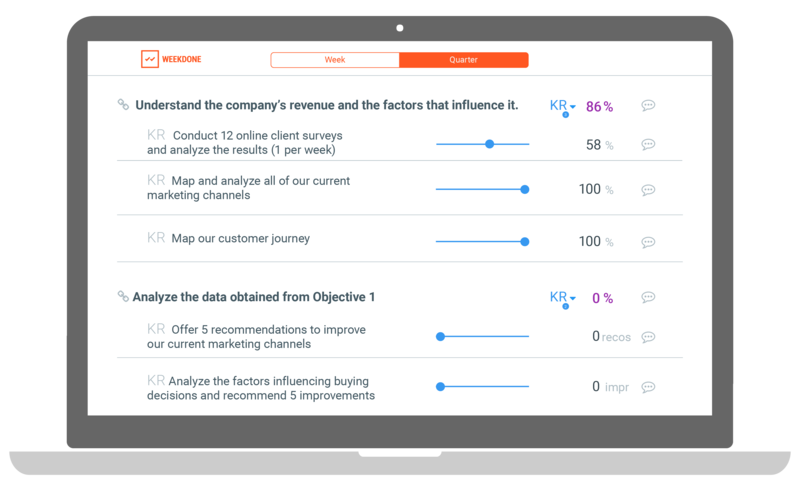 There is no need to have numeric metrics for objectives (you’ll have those with key results, but that we’ll discuss a little later.). You can see examples of different objectives for different teams at the end of this book. Actionable: Objectives should be goals that a person or a team can execute independently. Inspirational: They should excite employees and give them a reason to be excited on Monday morning when going to work. Time Bound: OKRs should be set quarterly so that people can get them done as fast as possible. Sam wanted his team to get results fast, so quarterly OKRs were a good fit. He also needed a new way to motivate the team, so he decided that employee goals should not be tied to their salary. It was a tough sell to management, who has always believed money to be a good motivator. Luckily, Sam’s idea prevailed. Sam argued that for the younger workforce, money is not as big of a motivator as most people think. Money is a motivator, of course, but if you pay employees enough, other factors come into play. Besides money, employees also need meaningful tasks that make them excited about their work. Everyone on the team and in management agreed that the purpose of the marketing team was to increase revenue, yet no one really understood why it was declining. To set OKRs, a team meeting was called. 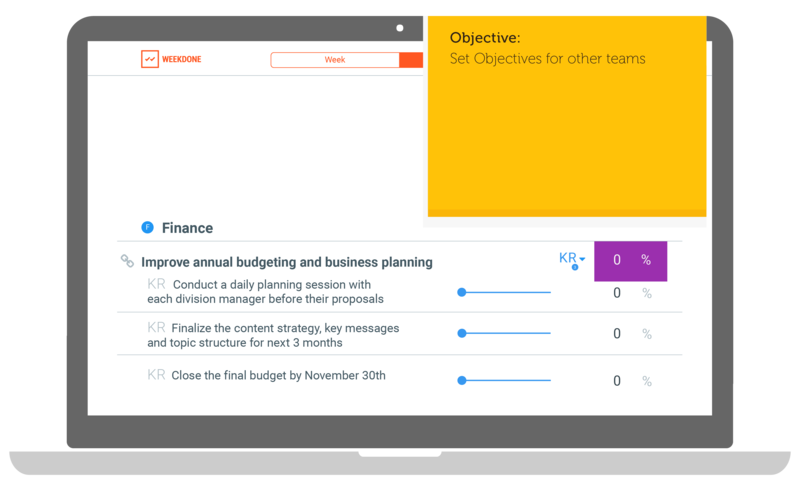 OKRs should always be set as a team: not only does it make sure that people can give their input, it ensures that everyone understands the final goal clearly. For the first quarter, they decided to set one company objective: “Understand the company’s revenue and the factors that influence it.” This is a good baseline objective example to help you get started. Notice, the objective itself has no indicators to measure success, yet it is still a goal that everyone can understand. What’s more, it ties directly to the company’s overall goal of increasing revenue. Specific: is the KR well-defined and understandable for everyone? Measurable: can you measure success or failure? Achievable: is it realistically possible to do? Relevant: is this KR important for your objective? Time-bound: have I clearly established when the goal must be met? For OKRs this time is usually one quarter. 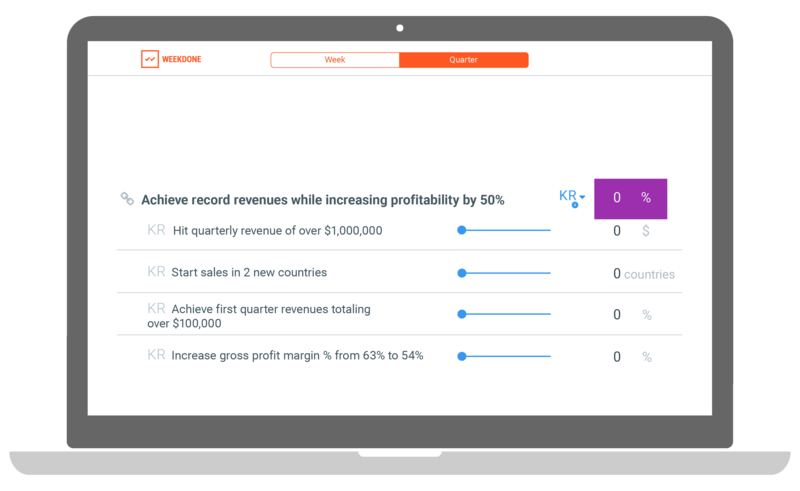 For the product team, you can measure percentages of jobs done; for sales, you can measure their success in dollars or another currency. You can also go binary with the “Done-Not Done” scale. While the objective was inspirational and got people thinking about the right things, the key results needed to give clear directions on what to do and how to do it. Sam decided on 3 KRs for their objective to keep it as simple as possible. Each KR was assigned to a different person in the team so it would be absolutely clear who was responsible for what. As one can see, all the KRs are easily measurable and give clear instructions for day to day operations. Of course, these are not the only things the marketing team will do. The OKRs don’t list every weekly mundane task that people do. OKR is a shining beacon for guiding everyone in the right direction. It also makes sure, the most important tasks get done as efficiently as possible. To get the best results OKRs should be aligned to one another. Each part of your company must know what's going on and how each part contributes to the whole. 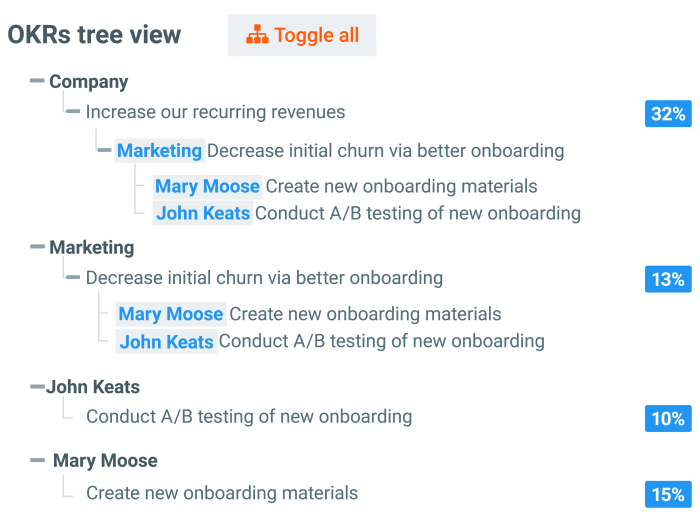 Our belief is that in order to get all the employees in your company working as one, they all should share an aligned, hierarchical tree of objectives and key results. The more visible, transparent, and up to date everyday progress is, the better it works. True success only arises if teams do what's best for the whole company and employees do what's best for the team. 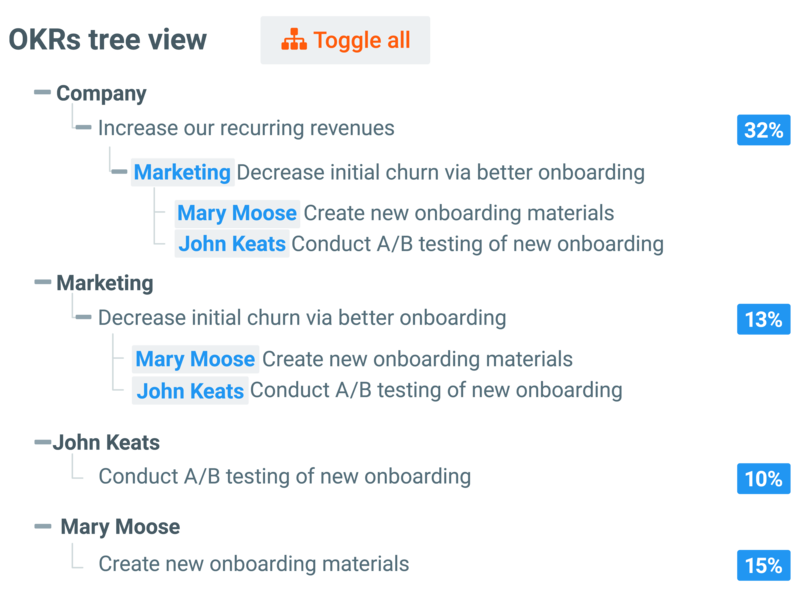 The first question that comes up is: should defining the OKRs happen bottom-up or top-down? There is no wrong or right way in this case. In some case upper management or the CEO outlines the company OKRs first and then asks team managers to set their team goals in accordance with the company ones, followed by personal employee goals based on team ones. In other cases, all employees are asked to come up with suggestions for their next quarter's activities. In both cases, you come together at the team level to reiterate them and add, delete, or modify some of them. In the end the process moves both ways. You need to go over the company level objectives and personal objectives many times before they work well together. That is all part of the process of setting and aligning goals. One of the main problems with any sort of goal setting technique is that after a lot of effort has been put into designing and shaping goals, people forget them and only remember them when they are due. OKR methodology addresses this problem with constant monitoring. The progress toward Key Results should be measured weekly to see how much has been done. If a week has passed and you’ve got no progress, there is a problem that should be addressed by the team leader and the person responsible for the goal. “It is crucial that we receive reports that show our OKRs and what progress we make each week to achieve those. I was pleased that this was customized by Weekdone for us. OKRs should be reviewed weekly to avoid discovering that you have no results at the end of the quarter. However, and this is important: you should not grade success based on your objectives. The grading goes on at the Key Results level. There are companies who like grading objectives by adding a binary “done-not done” mark on it. This commonly used model states that an objective is done if you complete all the KRs. So if you had 3 KRs and didn’t hit the mark on one of them, the objective stays at 0. 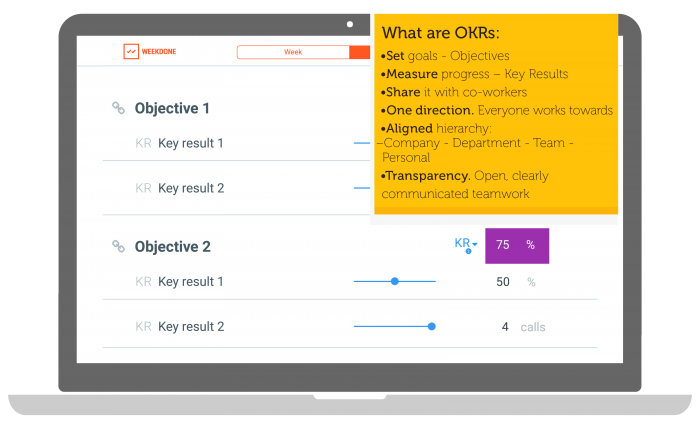 This tends to reduce morale and increase confusion as OKRs are often set very high and the risk of failure with some KRs is not only common but expected. KRs must always be measurable, and you need to figure out that criteria when setting them. With OKRs, it’s important to set them high enough that 100% is uncommon. Getting 100% should be a near-impossible feat that only a few teams accomplish. It is very common to finish your first quarter with mostly 100% or with mostly zeros, especially if you had no prior experience in setting OKRs. It’s important to remember that OKRs are not a project you run for 3 months. To work well, they must be used constantly and the progress must be improved every quarter. In 3 or 4 quarters, you should have a clear idea on how they work and most of your KRs should fall into the 70% category. Then you’re all set. Over the next 3 months, Sam started each of their weekly meetings with questions about OKRs. For the first few weeks, the answers came hesitantly as people hadn’t become used to the system yet, but by month two, everyone was on board. The results were discussed during a team meeting where people could explain the results. It turned out, that (For KR1) clients were not so keen on answering surveys, even though the person responsible tried to contact them every week. For KR2 and KR3, the mapping process was so extensive that there wasn’t enough time to analyze the results. All in all, Sam was happy with the results and the engagement level of the marketing team had improved considerably, which in turn meant that, though not shown in the OKRs, the sales numbers had started to improve a little. The data they collected was not only helpful for their team but helped other people working in the company as well. It’s important to understand that everyone in the company is connected, the success and failures of one team directly affect others. As Objective 1 was mostly completed and the hypothetical Objective 2 was left undone, Sam decided to use Objective 2 as one of the Objectives for the next quarter. 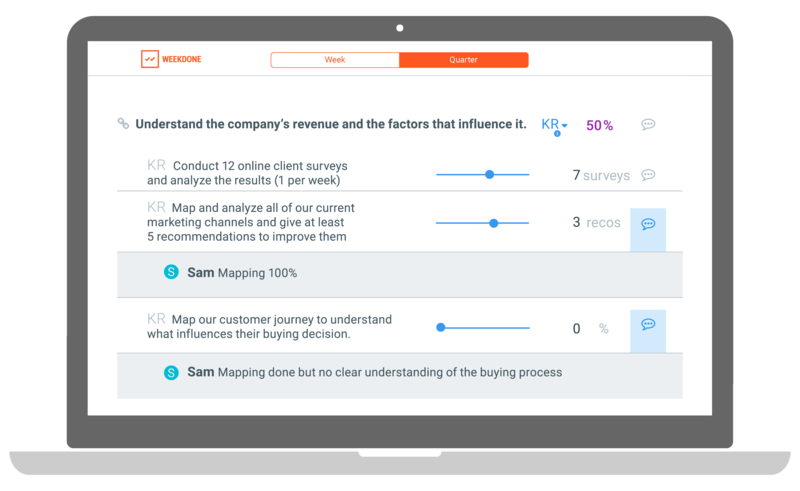 Over the next year the success of the marketing team convinced the executives to start using OKR methodology throughout the entire company. Sam continued running the marketing team while also helping other managers get started with OKRs. The company improved. The numbers went up and it also became a desired working environment. And they lived happily ever after. Sam was at a disadvantage as there was very few materials available on the methodology. This is a disadvantage that has now been eliminated thanks to a lot of writers and leaders who believe in Objectives and Key Results. Now, everyone can easily do what Sam did. This book has both the basic knowledge and practical examples you need to start implementing Objectives and Key Results in your team. We hope that your journey to become a goal setting master does not end here. Instead, we wish you many productive quarters of clear Objectives and well set Key Results. 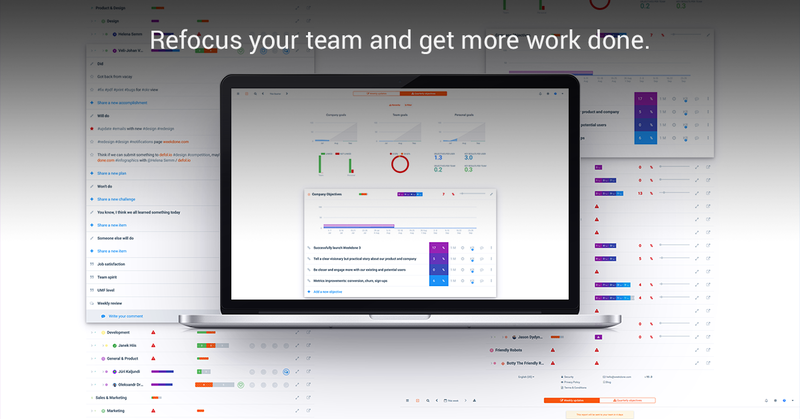 To make sure your team has clear goals and a strong synergy, try out Weekdone. Implementing Weekdone is instant. Just sign up for our free trial at weekdone.com, invite your employees and you’re all done. In less than a week, you will get your first structured employee progress report via e-mail from your people, one that you can quickly give feedback on. Go and make your goals a reality.